The service life of the injection mold is directly related to the production cost and efficiency of injection molding parts processing. If the injection mold has a high service life, on one hand, the production cost can be reduced, and on the other hand, the processing efficiency can be improved. So how can we improve the life of injection molds? Years of practice have shown that in order to improve the service life of injection molds must be considered from the following aspects. 1.To avoid the use of inadequate safety factors, injection molds are particularly prone to cracks. Each injection molding, the mold will be deformed, the greater the deformation, the mold sharp angle and small rounded corners occur faster fatigue cracks. Alloy steel, hard steel and mild steel have the same degree of deformation in a given load. Only by increasing the thickness of the mold can the deformation be reduced, and the thickness can be doubled, and the deformation can be reduced by half. A large number of injection molds break after short-term operation because it is not used with sufficient thickness. In the work of the mold to withstand a variety of stress, so the mold will produce deformation and fatigue, and the amount of deformation depends on the thickness of the mold. In order to reduce the deformation, the thickness of the mold must be increased, the thickness of the mold is doubled, and the total deformation is reduced by half; twice the mold thickness, the total deformation can be reduced to the original 1/3, which is a very useful experience in the design. 2.Molds can also be broken due to stacking or laminating. Designers generally prefer to use one or more of the less expensive steel plates to support a high-quality steel mold to reduce the cost of mold materials. However, in practice, this results in a spring-like structure. In the same state, when the thickness is the same, the amount of total deformation is much larger than that of the overall type. 3.Avoid sharp corners caused by the stress, a large number of injection molds are broken because of the lack of fillet transitions, so in the design often with rounded corners instead of sharp corners. Because the stresses are concentrated at the sharp corners, and after the corners are rounded, the stress will be distributed over the entire inner circle, thus reducing the pressure exerted on the die per unit area. Sometimes the small fillet radius can often increase the die's Life is many times. What important properties must good mold steel have? It must have good perish ability, abrasion resistance, toughness, and good dimensional stability during heat treatment so that the mold can have a longer service life. However, it is not possible to have all of the same in single steel. The good performance, so it must be coordinated. 1.The surface roughness value of the publishable injection mold is generally required to be small. Therefore, the steel must be clean, there is no inclusion that can affect the roughness of the light surface, and the steel structure must be uniform. 2.Abrasion is an important factor influencing the service life of the injection mold. 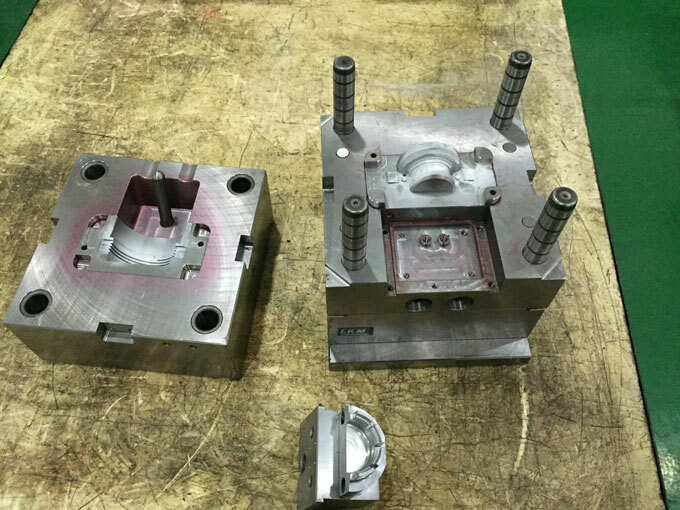 Therefore, the possible wear and tear of the mold should be inversely proportional to the surface hardness of the injection mold. If the wear is large, such as machining arc injection, the surface of the injection mold should be made. With high hardness, it is generally used to obtain high hardness of the mold steel or surface treatment of the mold, such as nitration, chrome plating or nickel plating. 3.Toughness of ductile injection molds is easy to produce cracks, and toughness is inversely proportional to hardness. If high toughness is required, for example, molds with sharp corners and small fillet radii should use low hardness, and use hard surfaces. The softer part of the center uses carbonizing, intruding, or chrome plating to obtain the higher surface hardness required for the mold, while still retaining good toughness at the center of the mold. 4.Dimensional Stability (Heat Treatment Deformation) unless the steel is already in the per-cured state, heat treatment must be performed to achieve the required hardness and heat treatment will often cause changes in the size of the injection mold. The size of the injection mold during heat treatment is generally corrected by fitters, but this method is difficult but it can use the grinding method to correct, and the grinding is easy to stress on the surface of the injection mold and mold failure in the dry period. Therefore, the mold steel with small heat treatment deformation is generally selected, which can reduce the difficulty of correction.